The older of two children, Francis Patrick Kenrick was born to Thomas and Jane Kenrick in Dublin, Ireland, on December 3, 1796. At the age of eighteen, he was selected to travel to Rome and study the priesthood at the College of Propaganda. This college was founded by the Congregation for Propagation of the Faith, a group of Roman Catholic cardinals who did missionary work. Kenrick was committed to his studies and upon completion was ordained to the Priesthood of the Eternal City on April 2, 1821. A few weeks later, Kenrick relocated to the United States, where he was chosen for the chair of theology at Bardstown Seminary in Kentucky. During his time in Kentucky, he also taught Greek and history at the college of St. Joseph as well as did missionary work. After nine years Kenrick left Kentucky and on June 6, 1830, at only thirty-four years of age, he became the third bishop of Philadelphia. After many years of tension among clergy members and laypeople within the diocese, Bishop Kenrick faced the task of reconstructing. He became very active in the community and doubled the number of parishes in Philadelphia. In 1832 Bishop Kenrick established Saint Charles Borromeo Seminary, originally located on Fifth Street in Center City, but his contribution to the diocese of Philadelphia did not stop there. He also had a vision for a new cathedral to bring the diocese together. On June 29, 1846, the feast day of Saints Peter and Paul, he began to bring his vision to life by issuing a pastoral letter stating that the building next to the Theological Seminary offered the prime location for the new cathedral. On September 6, 1846, he laid the cornerstone. 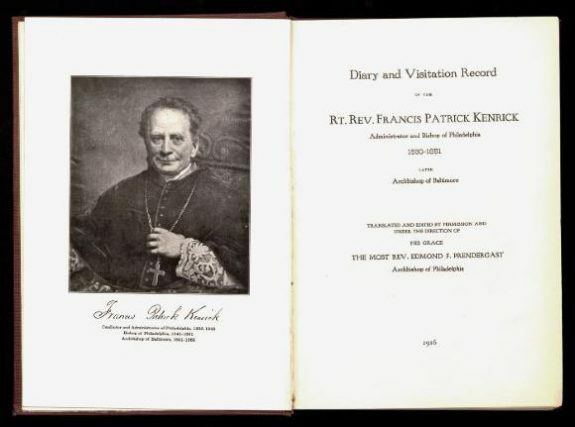 This portrait of Bishop Kenrick is included in his diary and visitation record, which was published in 1916. After Bishop Kenrick left Philadelphia and became the Archbishop of Baltimore in 1851, he was succeeded by Bishop John Neumann (1811-60), pictured here, and Bishop James Fredrick Wood (1813-83). Neumann was born in Prachatice, Bohemia (now in Czech Republuc) on March 28, 1811. He studied at the University of Prague and upon completion moved to New York to pursue missionary work. There, in 1836, he was ordained. 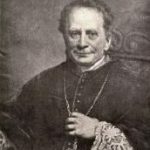 In 1852, Neumann was named the fourth bishop of Philadelphia. Bishop Neumann was dedicated to carrying out Bishop Kenrick’s work, but like Bishop Kenrick, he was committed to only continuing construction on the cathedral when funds were available. The cathedral was not completed in Bishop Neumann’s lifetime. Under Bishop Wood, who joined Bishop Neumann as a coadjutor in 1857, the Cathedral reached completion in 1864. Throughout his life, Bishop Wood was passionate about education as well as foreign missions. 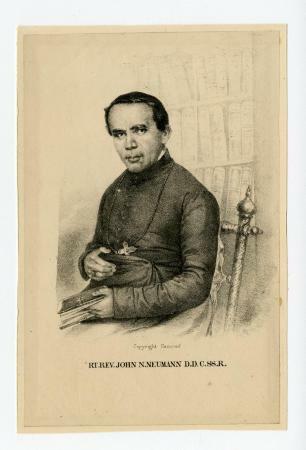 John Neumann was canonized a saint in 1977. 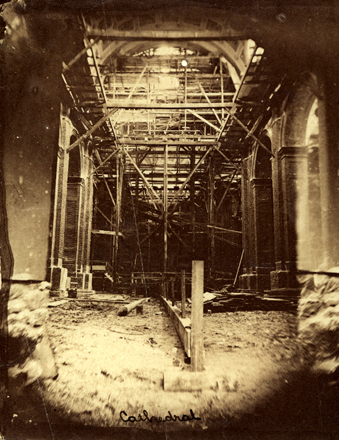 Due to lack of funds and other various complications, construction of the Cathedral Basilica of Saints Peter and Paul was slow. The exterior designs were executed by John Notman (1810-65) and the interior designs by Napolean LeBrun(1821-1901). The Roman-Corinthian architectural influence stems from the fact that the building was modeled after the Lombard Church of Saint Charles (San Carlo al Corso) in Rome. Due to the anti-Catholic riots that had taken place in 1844, the architects opted for clerestory windows instead of side windows. This design choice as well as the four stone Corinthian columns at the entrance of the cathedral contribute to its distinct appearance. This 1862 photograph, taken by Robert Newell and published in McAllister scrapbooks of views of Philadelphia, shows the interior construction of the cathedral. 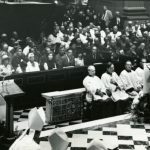 During the summer of 1976, the 41st Annual Eucharistic Congress brought clergy, religious, and laity to Philadelphia to celebrate the Eucharist and the presence of Jesus in their lives. 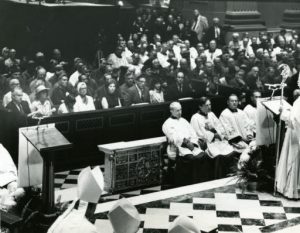 In this photograph, Papal Legate James Cardinal Knox addresses the congregation prior to the opening Mass at the Cathedral Basilica of Saints Peter and Paul on August 1, 1976. 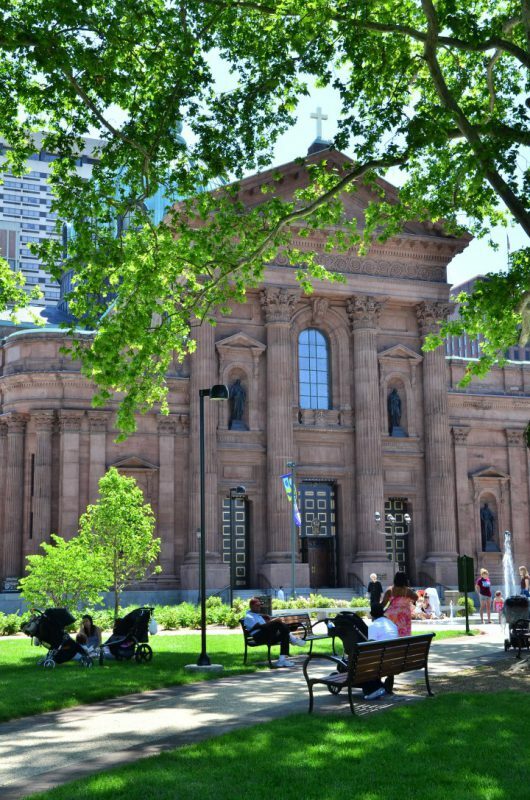 Established in 1846, the Cathedral Basilica of Saints Peter and Paul at Eighteenth and Race Streets became the principal church and center of Catholic life for the clergy and faithful of the Philadelphia archdiocese. During a turbulent era of immigration and anti-Catholic nativism, Bishop Francis Patrick Kenrick (1796-1863) desired a “common church of the whole diocese,” which at the time included Pennsylvania, Delaware, and parts of New Jersey. He envisioned the cathedral “on the front of a large public square,” where it would be a meeting ground for the local and universal Church, a place of liturgical practice for seminarians and professors from the nearby Theological Seminary of St. Charles Borromeo, a base for missionaries operating throughout the diocese, and “a splendid ornament” for Philadelphia. A cathedral is the bishop’s church, where he presides, teaches, and conducts worship for the Christian community of his area of ecclesial jurisdiction. Basilicas, according to the 1989 Vatican document Domus Ecclesiae, “stand out as a center of active and pastoral liturgy.” They indicate a special bond of communion with the pope, his concern for the faithful of all nations, and the strengthening of ties between the local and the universal Church. 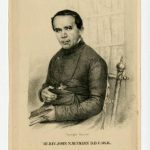 Philadelphia’s new cathedral acquired its site on Logan Square when Marc Anthony Frenaye (1783-1873), the diocese’s financier and a refugee from the Haitian Revolution (1791-1804), purchased the plot from the Farmers’ Life and Trust Co. of New York. Frenaye also purchased the four-story house that originally stood on the site, which subsequently became the cathedral rectory. Philadelphia architect Napoleon LeBrun (1821-1901), whose major work included St. Patrick’s on Rittenhouse Square (1839) and later the Academy of Music (1857), executed initial designs for the Roman-Baroque style church modeled on Rome’s San Carlo al Corso. Scottish-born Philadelphia architect John Notman (1810-65), who later built St. Clement’s (1856-59), contributed its Italian Renaissance Palladian façade. 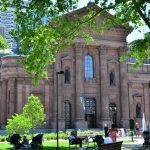 Construction on the imposing sandstone structure was slow, given the challenges of meeting the spiritual, pastoral, and social needs of Philadelphia’s expanding Catholic population and organizing the Philadelphia diocese. During the era of increasing Irish-Catholic immigration and diocesan expansion in the mid to late 1840s, Kenrick juggled lack of funds, debt, and initial opposition from priests and laypeople to the idea of building a new cathedral. Already suffering a shortage of priests and churches, they were concerned about maintaining their own parishes and the cost of rebuilding churches destroyed during the nativist riots that took place in Philadelphia in 1844. Leading up to 1845, some objected that Catholicism’s growth in Philadelphia did not yet warrant building a church exceeding any other church in the city in both cost and physical proportion. Some also considered the proposed site to be too far west from the city center and the bishop’s then-cathedral, St. John the Evangelist on South Thirteenth Street. Nonetheless, eight thousand people witnessed Kenrick lay the cornerstone on September 6, 1846. Laying the cornerstone for a new Catholic church is an elaborate ritual, in which the bishop explains its ecclesial and theological significance while also soliciting the faithful’s financial support. Catholics organized a system of block collections by parish to raise the requisite funds. After Kenrick became Archbishop of Baltimore in 1851, construction of the church continued under Bishop John Neumann (1811-60) and Archbishop James Frederick Wood (1813-83). 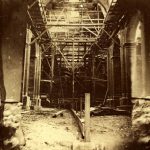 It proceeded through most of the Civil War, even while Philadelphia’s industrial importance in the conflict and continuing financial difficulty meant that church officials struggled to retain workers. The interior remained largely unembellished while details filled in slowly. Italian-born “artist of the United States Capitol,” Constantino Brumidi (1805-80), known for his mural The Apotheosis of George Washington (1865), executed five oil paintings for the ceiling dome in 1863: The Assumption of the Virgin into Heaven, and four of the evangelists Matthew, Mark, Luke, and John were in place for the Cathedral’s dedication—and opening for services—on November 20, 1864. Philadelphian Edwin F. Durang (1829-1911) designed a marble high altar, placed in 1883-84 before the church’s consecration in 1890. By the mid-twentieth century, it boasted interior and exterior renovation work by Philadelphia’s Henry Dandurand Dagit (1865-1929), and the firms of Daprato (Chicago) and Eggers and Higgins (New York), among others. During the building’s construction, the Friends of the Cathedral society saw its potential for evangelization in the surrounding neighborhood, which was becoming both Protestant and wealthy. The cathedral became the base of operations for several Catholic civic organizations, such as the Total Abstinence Society, the Ladies’ Society, and Cadet Societies for boys and girls. During the early twentieth century, construction of the Benjamin Franklin Parkway placed the Cathedral amid a developing museum district. The building merited placement on the National Register of Historic Places in 1971 on the basis of the architectural significance of the work by LeBrun, Notman, and Brumidi and the religious/philosophical significance of its roles as “the center of Catholic life of Philadelphia” and longtime church of St. John Neumann—the first canonized U.S. bishop, whose cause for canonization was underway at the time. The cathedral has continued to play an active role in the lives of Philadelphia’s Catholics. In the summer of 1976, Philadelphia’s celebration of the American Revolution’s bicentennial coincided with the Forty-First International Eucharistic Congress (August 1-8) held in the city. Following the congress, at the request of then-archbishop John Cardinal Krol (1910-96), Pope Paul VI (1897-1978) designated the Cathedral of SS. Peter and Paul a basilica, solidifying its role as the meeting ground between the Philadelphia archdiocese and the universal Church that Bishop Kenrick had originally intended: during a papal visit in 1979, Pope John Paul II (1920-2005) prayed in the cathedral and celebrated Mass in Logan Circle; in 2015, Pope Francis (b. 1936) publicly celebrated Mass at the cathedral and on the Benjamin Franklin Parkway during the World Meeting of Families. The Cathedral Basilica of SS. Peter and Paul has remained an architectural focal point for Philadelphia and a major site of worship, devotion, and Catholic identity. Wendy Wong Schirmer, a historian of Early America and U.S. foreign relations, received her Ph.D. from Temple University. She is working on a book project that examines the relationship between print culture, neutrality in the Early Republic, and the politics of slavery. American Catholic Historical Society. A Cathedral Is Built: Cathedral of Saints Peter and Paul. Philadelphia: American Catholic Historical Society, 1964. Connelly, James F. The History of Archdiocese of Philadelphia. Philadelphia: The Archdiocese of Philadelphia, 1976. Greiff, Constance M. John Notman, Architect, 1810-1865. Philadelphia: The Athenaeum of Philadelphia, 1979. Administrator and Bishop of Philadelphia, 1831-1852, Later Archbishop of Baltimore. Trans. Francis Edward Tourscher. Lancaster, Pa.: Wickersham Printing Co., 1916. Kenrick, Francis Patrick, and Mark Antony Frenaye. The Kenrick-Frenaye Correspondence, 1830-1862. Philadelphia: The Archdiocese of Philadelphia, 1920. Light, Dale. “The Reformation of Philadelphia Catholicism, 1830-1860,” Pennsylvania Magazine of History and Biography, 112 (July 1988): 375-405. Prendergast, Edmond F. A Brief History and Description of the Cathedral of SS. Peter and Paul. Catholic Standard and Times Print: Philadelphia, 1917. Moss, Roger W. Historic Sacred Places of Philadelphia. Philadelphia: University of Pennsylvania Press, 2005. Warren, Richard A. “Displaced `Pan-Americans’ and the Transformation of the Catholic Church in Philadelphia, 1789-1850,” Pennsylvania Magazine of History and Biography 128 (October 2004): 343-66. Dagit Collection, Lovatt Collection, Karl Lutz Collection, and Roger W. Moss research files for Historic Sacred Places of Philadelphia, Athenaeum of Philadelphia, 219 S. Sixth Street, Philadelphia. Catholica Collection, Falvey Memorial Library, Villanova University, 800 E. Lancaster Avenue, Villanova, Pa.
Campbell Collection, Historical Society of Pennsylvania, 1300 Locust Street, Philadelphia. Cathedral Basilica of SS. Peter and Paul, Eighteenth and Race Streets, Philadelphia. St. John the Evangelist Roman Catholic Church, 21 S. Thirteenth Street, Philadelphia. Logan Square, bounded by Eighteenth, Twentieth, Race, and Vine Streets, Philadelphia. Wendy, thanks for this well written essay on such an important topic. When I was giving tours of the city during the Papal visit in 2015, I stressed that 36% of the population within the 2,000 square mile Metropolitan Province of Philadelphia identified as Roman Catholic, making it by far the largest religious denomination in the area. LeBrun and Notman’s Cathedral Basilica, with its long history and stunning architecture, serves as a magnificent mother church for that significant demographic.